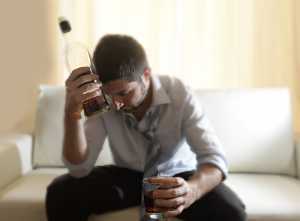 Alcoholism is a physical and psychological need for and dependence upon alcohol. It becomes impossible for an alcoholic to go through the day or complete any normal daily tasks without drinking, and they will continue to do so despite it drastically affecting their work, finances and relationships with their loved ones. Alcoholics behave in a way that those who can easily manage their drinking would view as unreasonable. They can become violent, lose their job and their home, or become involved in crime if their habit becomes particularly destructive. Excessive drinking also has a profound effect on a person’s physical and mental health, and can result in liver failure and death in severe cases. Drinking alone and in secret. Drinking so much the individual blacks out and cannot remember recent events. Becoming anxious when alcohol is not accessible. Hiding alcohol in unusual, secret places. Not being able to limit alcohol intake. Allowing alcohol take precedence over work, hobbies and interests and time spent with family and friends. Drinking increasingly larger amounts in order to get drunk. Getting into violent and dangerous situations when drinking, such as driving, violent behavior, or breaking the law. Alcoholism is both a physical and a mental condition, so there is no one specific, definite cause. There are risk factors associated with alcoholism though, and things that make it more likely in an individual. Stress hormones have been linked to alcoholism, as well as anxiety and depression. Alcohol is sometimes used by people to self-medicate when they’re finding their daily life hard to cope with or have recently experienced a traumatic incident. This can develop into an addiction over time. Studies have found there are some genetic factors too. Those with a family history of addiction are more likely to be at risk of developing an addiction themselves. Those who have their first alcoholic drink before the age of 15 are more likely to develop a drinking problem in later life, partly because of exposure and ease of access. Experimentation and binge drinking. Alcoholism generally begins as occasional alcohol abuse and experimentation. This is commonly seen in young adults and can consist of excessive drinking in social situations. ‘Excessive drinking” generally consists of consuming more than four or five beverages within two hours, drinking until blacking out or until getting sick. Regular and increased drinking. When the individual is a more experienced drinker and their experimentation phase is over, they may begin to increase the frequency of their drinking and the amount. This could be out of habit, as a result of stress and loneliness, or even out of boredom. The individual is beginning to associate alcohol with making themselves feel better in certain situations. Drinking becomes a problem. When alcohol use becomes abuse it’s a problem. The individual starts experiencing the impact of their drinking habit, as well as the consequences on their mental health and social life. They may experience relationship problems, as well as lose old friends and gain new ones who enable this destructive lifestyle. Dependence on alcohol. With greater amounts of alcohol comes a greater tolerance. At this stage of dependence, the individual will find they need to drink more to feel the same effects. Moments of sobriety will bring unpleasant physical withdrawal symptoms. Addiction. At this later and most severe stage, the individual doesn’t feel a need to drink for pleasure, they simply cannot stop. The liver is possibly the most resilient organ in the human body. One of its roles is to detoxify our blood after drinking alcohol. Alcoholics and alcohol abusers put their liver through a tremendous amount of stress, and force it to process more toxins than it’s able to. This can develop into cirrhosis, jaundice and chronic liver disease, and even shut down the liver completely. Like any organ, our liver is essential and we cannot live without it. Liver damage really is the tip of the iceberg, however. Alcohol can gradually poison and impair the majority of the body if drunk in excess, from the central nervous system to the reproductive organs. Before an alcoholic will benefit from or even accept treatment, they must feel that they genuinely need it. Help can come in the form of counseling and group sessions, inpatient treatment in a dedicated facility, detox and rehabilitation. Detoxification is an often uncomfortable and unpleasant procedure that completely rids the body of alcohol and demands complete sobriety. Treatment centers can offer medication to help this process along and alleviate the withdrawal symptoms. The focus of treatment is to help the individual achieve sobriety and give them the right tools to maintain it. With this, they can get their lives back on track, rebuild relationships, go back to work, and live a healthier, happier life.